We print the following story from Greg Palast in its entirety to honor the memory of our most important mentor, the father of the Republican resurgence in Texas following the murder of Kennedy and the insertion of LBJ, a great Republican in Dem clothing who in reality hated the Liberals, as we do, of course. Kudos, Poppy! It's not the content of anyone's character that counts in the end, is it? It's the color of money, and blood. While pundits were falling all over themselves spewing about the “civility” of the patrician George H. W. Bush, l must honor the memory of those 50 men who were buried alive in a gold field in Africa so Bush Sr. could cash in. To me, this is the most important story of my career — and almost ended it when Bush’s gold mining company (I bet you didn’t know he had one) sued my paper, The Guardian, threatening it with bankruptcy for telling the truth. I dedicate this story to those miners, buried without pomp, buried by bulldozers while still alive. And to Tundu Lissu the Tanzanian lawyer, father of twins, who risked his life to provide me the corroborating evidence. Tundu has taken twelve bullets, but survives. Here is the story as originally published in the first U.S. edition of The Best Democracy Money Can Buy. In the final days of the Bush (Senior) administration, the Interior Department made an extraordinary but little noticed change in procedures under the 1872 Mining Law, the gold rush–era act that permitted those whiskered small-time prospectors with their tin pans and mules to stake claims on their tiny plots. The department initiated an expedited procedure for mining companies that allowed Barrick to swiftly lay claim to the largest gold find in America. In the terminology of the law, Barrick could “perfect its patent” on the estimated $10 billion in ore — for which Barrick paid the U.S. Treasury a little under $10,000. Eureka! Barrick, of course, had to put up cash for the initial property rights and the cost of digging out the booty (and the cost of donations, in smaller amounts, to support Nevada’s Democratic senator, Harry Reid). Still, the shift in rules paid off big time: According to experts at the Mineral Policy Center of Washington, DC, Barrick saved — and the U.S. taxpayer lost — a cool billion or so. Upon taking office, Bill Clinton’s new interior secretary, Bruce Babbitt, called Barrick’s claim the “biggest gold heist since the days of Butch Cassidy.” Nevertheless, because the company followed the fast-track process laid out for them under Bush, this corporate Goldfinger had Babbitt by the legal nuggets. Clinton had no choice but to give them the gold mine while the public got the shaft. Barrick says it had no contact whatsoever with the president at the time of the rules change. There was always a place in Barrick’s heart for the older Bush — and a place on its payroll. In 1995, Barrick hired the former president as Honorary Senior Advisor to the Toronto company’s International Advisory Board. Bush joined at the suggestion of former Canadian prime minister Brian Mulroney, who, like Bush, had been ignominiously booted from office. I was a bit surprised that the president had signed on. When Bush was voted out of the White House, he vowed never to lobby or join a corporate board. The chairman of Barrick openly boasts that granting the title “Senior Advisor” was a sly maneuver to help Bush tiptoe around this promise. I was curious: What does one do with a used president? Barrick vehemently denies that it appointed Bush “in order to procure him to make contact with other world leaders whom he knows, or who could be of considerable assistance” to the company. Yet, in September 1996, Bush wrote a letter to help convince Indonesian dictator Suharto to give Barrick a new, hot gold-mining concession. Who is this “Barrick” to whom our former president would lease out the reflected prestige of the Oval Office? I could not find a Joe Barrick in the Canadian phone book. Rather, the company as it operates today was founded by one Peter Munk. The entrepreneur first came to public notice in Canada in the 1960s as a central figure in an insider trading scandal. Munk had dumped his stock in a stereo-making factory he controlled just before it went belly up, leaving other investors and government holding the bag. He was never charged, but, notes Canada’s Maclean’s magazine, the venture and stock sale “cost Munk his business and his reputation.” Yet today, Munk’s net worth is estimated at $350 million, including homes on two continents and his own island. Khashoggi got out of Barrick just after the Iran-Contra scandal broke, long before 1995, when Bush was invited in. By that time, Munk’s reputation was restored, at least in his own mind, in part by massive donations to the University of Toronto. Following this act of philanthropy, the university awarded Munk–adviser Bush an honorary degree. Several students were arrested protesting what appeared to them as a cash-for-honors deal. Mr. Munk’s president-for-hire did not pay the cost of his rental in Indonesia. The return on Barrick’s investment in politicians would have to come from Africa. Mobutu Sese Seko, the late dictator of the Congo (Zaire), was one of the undisputed master criminals of the last century having looted hundreds of millions of dollars from his national treasury — and a golfing buddy of the senior Bush. That old link from the links probably did not hurt Barrick in successfully seeking an eighty-thousand-acre gold-mining concession from the Congolese cutthroat. Bush himself did not lobby the deal for Barrick. It wasn’t that the former president was squeamish about using the authority of his former posts to cut deals with a despot. Rather, at the time Bush was reportedly helping Adolf Lundin, Barrick’s sometime industry rival. Africa specialist Patrick Smith of London disclosed that Bush called Mobutu in 1996 to help cinch a deal for Lundin for a mine distant from Barrick’s. Rebellion against Mobutu made the mine site unusable, though not for the company’s lack of trying. In testimony in hearings convened by the minority leader of the House Foreign Affairs Subcommittee on Human Rights, expert Wayne Madsen alleged that Barrick, to curry favor with both sides, indirectly funded both and thereby inadvertently helped continue the bloody conflict. The allegation, by respected journalist Wayne Madsen, has not been substantiated: The truth is lost somewhere in the jungle, where congressional investigators will never tread. Though Barrick struck out in Indonesia and the Congo, the big payoff came from the other side of the continent. The company’s president bragged to shareholders that the prestige of the Mulroney-Bush advisory board was instrumental in obtaining one of the biggest goldfields in East Africa at Bulyanhulu, Tanzania. Barrick, according to its president, had hungered for that concession — holding an estimated $3 billion in bullion—since the mid-1990s, when it first developed its contacts with managers at Sutton Resources, another Canadian company, which held digging rights from the government. [See footnote 1.] Enriched by the Nevada venture, Barrick could, and eventually would, buy up Sutton. But in 1996, there was a problem with any takeover of Sutton: Tens of thousands of small-time prospectors, “jewelry miners,” so called because of their minuscule finds, already lived and worked on the land. These poor African diggers held legal claim stakes to their tiny mine shafts on the property. If they stayed, the concession was worthless. In August 1996, Sutton’s bulldozers, backed by military police firing weapons, rolled across the goldfield, smashing down worker housing, crushing their mining equipment and filling in their pits. Several thousand miners and their families were chased off the property. But not all of them. About fifty miners were still in their mine shafts, buried alive. Buried alive. It’s not on Bush’s resume, nor on Barrick’s Web site. You wouldn’t expect it to be. But then, you haven’t found it in America’s newspapers either. I apologize if this photo of a burial is not as pretty as the one afforded George H. W. Bush. The corpse was pulled from the Bulyanhulu gold mine in Tanzania where 50 “jewelry” miners were buried alive to clear the gold field for sale to Barrick Gold. Barrick had hired Bush Sr. to help seal this deal and others. This photo and video was provided by Tanzanian lawyer Tundu Lissu who risked his life to get it to me and The Guardian. There are two plausible explanations for this silence. 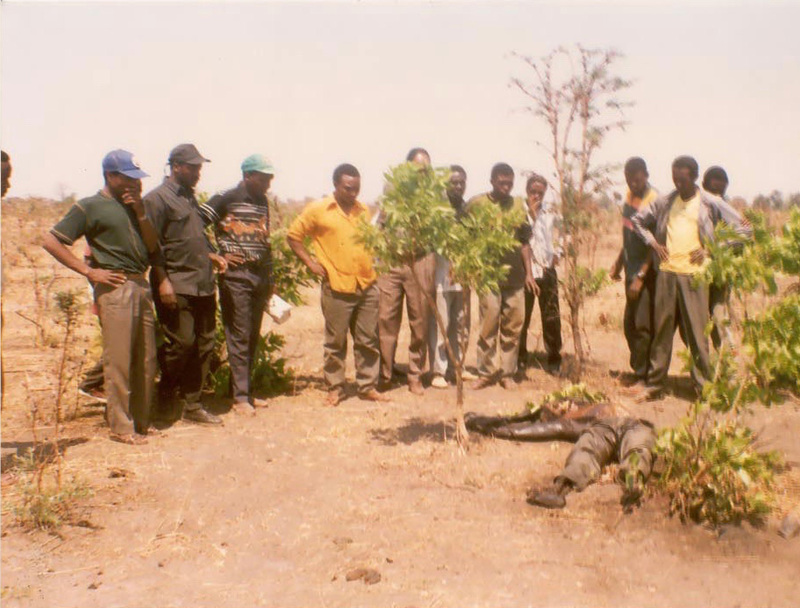 First, it never happened; the tale of the live burials is a complete fabrication of a bunch of greedy, lying Black Africans trying to shake down Sutton Resources (since 1999, a Barrick subsidiary). That’s what Barrick says after conducting its own diligence investigation and relying on local and national investigations by the Tanzanian government. And the company’s view is backed by the World Bank. See Chapter 8 of my book The Best Democracy Money Can Buy for more on this. There’s another explanation: Barrick threatens and sues newspapers and human rights organizations that dare to breathe a word of the allegations — even if Barrick’s denials are expressed. I know: They sued my papers, The Observerand Guardian. Barrick even sent a letter to the internationally respected human rights lawyer Tundu Lissu, a fellow at the World Resources Institute in Washington, DC, outlining its suit against The Observer and warning that it would take “all necessary steps” to protect its reputation should the Institute repeat any of the allegations. Barrick’s threats are the least of Lissu’s problems. For supplying me with evidence — photos of a corpse of a man allegedly killed by police during the clearance of the mine site, notarized witness statements, even a police video of workers seeking bodies from the mine pits — and for Lissu’s demanding investigation of the killings, his law partners in Dar es Salaam have been arrested and Lissu charged by the Tanzanian government with sedition. In 1997, while Bush was on the board (he quit in 1999), Mother Jones magazine named Barrick’s chairman Munk one of America’s “10 Little Piggies” — quite an honor for a Canadian — for allegedly poisoning the West’s water supply with the tons of cyanide Barrick uses to melt mountains of ore. Notably, one of the first acts of the junior Bush’s Interior Department in 2001 was to indicate it would reverse Clinton administration rules requiring gold extractors to limit the size of waste dumps and to permit new mines even if they were likely to cause “substantial, irreparable harm.” The New York Times ran a long, front-page story on this rule-relaxing windfall for Nevada goldmining companies, but nowhere did The Times mention the name of the owner of the largest gold mine in Nevada, Barrick, nor its recent payroller, the president’s father. Barrick has responded to every allegation reported in my first report on the company in a manner certain to get my attention: The company and its chairman sued my papers, The Guardian and Observer. While I have a distaste for retort by tort, I have incorporated their legitimate concerns to ensure their views are acknowledged in Chapter 8 of my book, The Best Democracy Money Can Buy. A bit of confusion here: Barrick swore to my paper that the alleged killings “related to a time years before [Barrick] had any connection whatsoever with the company to which the report referred.” Yet Barrick’s president and CEO, Randall Oliphant, told Barrick’s shareholders that prior to their acquisition of Sutton, “we followed the progress at Bully (i.e., Bulyanhulu) for five years, remaining in close contact with the senior management team.” That would connect them to the mine in 1994. The mining company wants me to report their version of events. Okay, here’s both of them. Greg Palast (Rolling Stone, Guardian, BBC) is the author of The New York Times bestsellers, The Best Democracy Money Can Buy and Billionaires & Ballot Bandits, now out as major motion non-fiction movie: The Best Democracy Money Can Buy: The Case of the Stolen Election, now available on Amazon and Amazon Prime. Stay informed, get the signed DVD, a signed copy of the book companion or better still - get the Book & DVD combo. AmazonSmile will donate 0.5% of your purchases to the Sustainable Markets Foundation which automatically goes to the benefit of The Palast Investigative Fund and you get a tax-deduction! More info. Copyright © 2018 Greg Palast, All rights reserved.